Following the release of their sophomore ‘Scatterbrain’ back in October, The Xcerts have been steadily rising in terms of exposure and buzz, recently completing the Rock Sound Exposure tour across the UK. Literally a few weeks after it’s over they’re back on the road again for a headline run of the country, proving they’re a trio working hard for what they want and deserve. Instrumental outfit Brontide (****) may be lacking words for a literal spoken message, but what they portray in their music and stage presence is far from silent or dismal. Despite consisting of only three members their scope of what’s achieveable remains vast and large, with the aid of a series of loops in guitars from guitarist Timothy Hancock, intricate bass lines from Nathan Fairweather and the intimidating yet captivating drum work of William Bowerman. Accelaration and adrenaline is reduced considerably with the more indie-pop-rock driven sounds of You Animals (***), and injecting a more light-hearted vibe into The Sugarmill. The small and quick jokes, the constant “thank you” gestures and interactions with the crowd alongside the bouncy nature of songs like ‘You Left You Heart In The City’ and ‘Everyday’s Like A Friday Night’ are a nice transgression of settlement before the night’s headliners. What’s more, the charismatic charm and seal-like clapping from vocalist Ryan Needham brings a slight animal nature to the man himself. Aberdeen-born and Bristol-grown trio The Xcerts (****) play to a room not even half full, which is confusing due to the quality of their live performance. The soulful and even at times haunting rendition of ‘Lament’ exposes frontman Murray Macleod at an almost vulnerable stance, pouring out each word with emotion and almost heartache, engaging the embraced audience. ‘Scatterbrain’ and ‘Slackerpop’ bring a far more poppy and upbeat moment into their set, before coming into set closer ‘Hurt With Me’ where the three-piece show their set at its rawest and most honest, leaving Murray crooning “Hurt with me” down the microphone whilst his guitar lays on the floor resonating distortion. NEWS: Taking Back Sunday rescheduled tour begins next month! 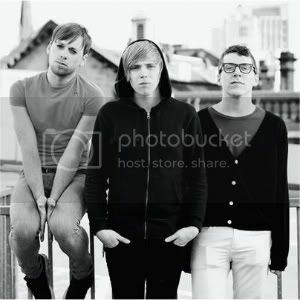 NEWS: The Xcerts give away cover of ‘White Christmas’ for free download! NEWS: The Xcerts announce new acoustic EP, ‘Late One Night’! NEWS: 2000 Trees Festival announce more bands for their 2013 line-up!